No recipe here, exactly. Made a very green salad for dinner last night. After I had broken my food processor the night before, I labored at the cutting board with knife and cut and sliced away at: romaine lettuce, fresh kale, savoy cabbage, green zucchini, cucumber, celery, shallots, and then a little color with carrots and tomatoes. I made an olive oil, rice vinegar, apple juice, and brown rice syrup dressing on the side. Little bowls containing sunflower seeds, hemp seeds, diced fresh figs, and calamata olives for the taking provided some added nutritional complements. I had two helpings of the salad and the rest of the family enjoyed it as well. No salad pictures, but here is a photo of why we are wearing our coats this week in Phoenix. 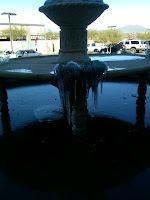 This is a photo of our icicle-laden fountain by our church. We're off to Old West Cave Creek today for some flea marketing. At least the sun is shining, but we will still need our coats today.